The documents below are provided for the use of organizations who will be hosting a Skylight Quartet concert event. It is our hope that they will be useful and beneficial in making our time with you a big success. They are available several formats below. Please check out the thumbnails and description select any which might be useful to you. This a high resolution JPEG photo of the Skylight Quartet which can be used as desired in your promotion of the concert. Right-click on the thumbnail and select "Save Target As" to download the file. This poster is a PDF document with text boxes over a gradient-colored background for typing in your info before printing. Right-click on the thumbnail above to download and save the file. We also offer three sample scripts for inclusion in your announcements. The scripts can be copied and pasted as needed. 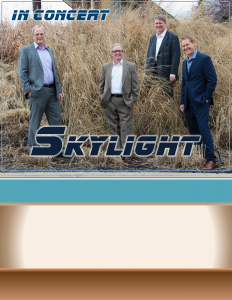 (insert DATE,CITY,STATE and event start time) For over 10 years, Skylight Quartet has been delivering the gospel message in song with their spiritually uplifting musical ministry across parts of America. Come out and enjoy a night filled with comedy, uplifting music and the precise four part harmony Skylight is known for! This special night will be unforgettable for all. Skylight Quartet sings songs that raise people’s spirits, bring smiles to faces, and make great memories! 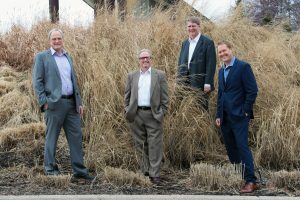 Skylight Quartet features the spectacular sounds of Kurt Vander Loon singing bass, Rob Schrock singing baritone, Mike Looney singing lead and Robert Vander Leest singing tenor. Mark your calendar for this special appearance by the Skylight Quartet at (LOCATION and TIME). Invite your friends and church groups to experience a (insert MORNING, AFTERNOON EVENING) of wonderful gospel music with this popular gospel group.